KANSAS CITY, KAN. --- A former softball standout at Kansas City Kansas Community College is the College’s new assistant softball coach. 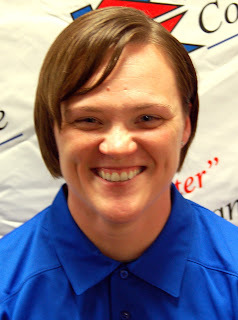 Taci Beatty, who earned all-conference honors in each of her two seasons at KCKCC, has begun her duties as assistant to head coach Kacy Tillery. A KCK native, Beatty played both softball and volleyball at Washington High School from where she graduated in 2001. Playing shortstop, third base and centerfield at KCKCC, Beatty was named to the All-Jayhawk Conference team in 2002. She sat out the next season to take care of an ailing grandmother but returned in 2004 and earned All-Jayhawk honorable mention on a Blue Devil team that won the Region VI championship for only the second time in KCKCC history and earned a berth in the NJCAA national tournament. She has been a member of the U.S. Army Reserves since 2007. Completing basic training and graduating from Military Police school in 2008, she was called for a year of duty in Iraq in October of 2008 and just returned from a nine-month tour of duty in Kandahar, Afghanistan, earlier this month. The daughter of Debi and Terry Beatty of KCK, she has two younger brothers, Justin and Josh, also of KCK.